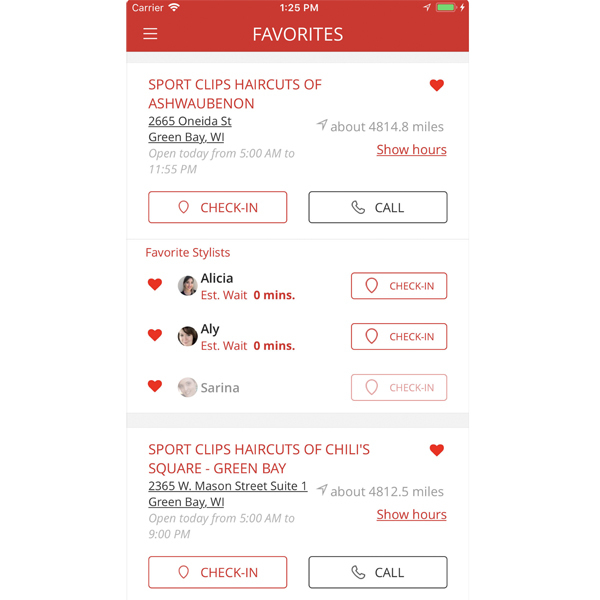 Sport Clips Haircuts has launched a new mobile app that makes check-in for a haircare service faster and easier. Beyond mobile check-in, the app offers information about wait times, the choice of a favorite store and preferred stylist and the ability to set personal reminders for the next MVP Experience. After checking in, the client is provided an approximate time to arrive at the store. Once inside, a digital display mounted near the front counter will display the client’s first name and last initial. A quick check in at the in-store kiosk upon arrival completes the process for the client. The mobile app also allows for “guest” check-ins for clients who are bringing along a family member or friend for a haircare service. One reviewer says of the app, “I’ve been using Sport Clips for years and been waiting for an app. The app has surpassed my expectations! It is easy to set up and use when it comes to adding your favorite location and stylist. Makes checking in a breeze! Another great win for the Sport Clips Team!” – Jbro82. The app is available in the Apple app store for iPhone® and through Google Play for Android™ devices. For more information about Sport Clips and to find a location near you, visit SportClips.com. Scroll through the slideshow to see the app!